Can you believe it’s time again? 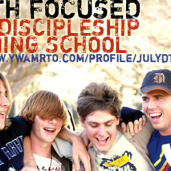 Another Discipleship Training School (DTS) is starting with 19 students (6 boys and 13 girls) from 5 different nations. They come from Australia, America, Austria, UK and New Zealand. What a joy to see the young people of the nations come together! We also have five staff helping with this school: Katie from the USA, Chelsea from Canada, Andrea from Australia, Mike from New Zealand, and Sam from Australia. We’re excited about this awesome group of young leaders and it will be great to mentor them and help them grow in their leadership while they help lead the students. Ryan will be leading this DTS, which is his sixth one to lead. I have opted out of having a formal role for this school since life is more than busy with Levi as well as the other things I’m involved in on base (ie staff leadership development and pastoral care). Although I won’t have a formal role in the DTS, I will be involved – sometimes attending lectures, helping on “ministry” days, mentoring the staff with Ryan, and meeting with students as the need arises. We’re both looking forward to seeing a new set of young people get a better grasp on their identity in Christ, catch a fire in their hearts for missions, and have revelation about how they can make a positive impact in the world through their lives. Both Ryan and I will also be teaching on the DTS: Ryan will teach on the Lordship of Christ and I will teach on Missions. We love having these opportunities to teach and minister on subjects we’re so passionate about. Please pray for us as we jump into this new, busy season with the DTS as we continue to learn what it looks like for us to remain balanced and faithful in our new roles combing ministry with parenthood.